Hi ML Enthusiasts! Today, we are going to learn about the mathematics behind linear regression. and, c is called as intercept in mathematical terms. It can also be described as the variation in predicted value which can’t be explained by x or the input variable(s). The above equation predicts value of y for each value of x. While making machine learning models, we divide the dataset into two parts: one part is called as the training data and the other as test data. We make the model learn using training dataset and then make predictions for the observations of test dataset. We then compare the predicted values with the real output values for the corresponding observations. For convenience, we will be using to represent the actual values of the output variable and to represent the predicted values of the output. Line of Best Fit is the line which is made in such a way that the sum of square of errors (difference between the values predicted by it and the actual values of the output) is minimized. Thus, we can come out with many equations for making our predictive model. But, the model that we will choose has to be the model which corresponds to the line of best fit. Now, the question arises how to find the line of Best Fit? We define the error as the difference between the actual value of y and the predicted value of y. This error is calculated for every observation and thus can be positive or negative. Thus, squaring of each error is done to overcome the problem of cancellation of positive values with negative values of errors upon addition. Coming back to our previous question, we follow the method of least squares to find the line of best fit. Now, we have two equations and two unknowns, m and c. Solving the above two equations will result in those values of m and c which will give us an optimal solution and hence the equation for line of best fit. Sometimes we encounter some problems that do not seem to be linear at first. The relation between them can be exponential and thus non-linear. In such a case, it is required to convert those non-linear problems into linear problems and then find out the ‘Line of best Fit”. 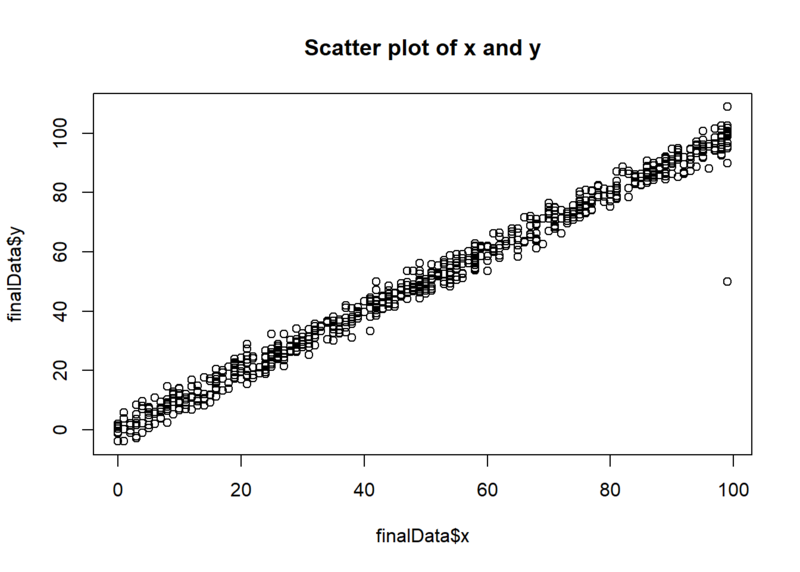 R Squared tells us about how much variation in is explained by xi in our model. R squared generally varies between 0 to 1 with the value of R squared equal to 1 signifying that our model is very accurate and 0 meaning model is very bad. Thus, if R squared = 1, we have SSE = 0 or a perfect model. If R squared = 0, we have SSE = SST or = mean of . Thus, the model comes out to be very bad. If it comes out to be a negative value, then we can say that the predicted value is worse than model having R squared = 0. With this I conclude this tutorial. Stay tuned for more informative tutorials.